Last week my husband and I went apartment hunting. Our house is being sold and our landlord will not be renewing our lease in June. So we have intermittently been going out with a realtor to see what’s available. The realtor always drives us to places and makes both of us sit in the back seat, chauffeur-style. It’s formal and not altogether comfortable, but neither my husband nor I have the temerity to mess with custom in this case. At one high rise building in Nishi Azabu, we went down under the building into the parking lot and the realtor asked the attendant where to park precisely, since he was showing one of the available apartments. Instead of telling us, the guy hopped on a nearby bicycle, and let us down two floors and across the third to find the realtor space. From the point of view of the rear of the car, it was hysterical to see this little man, probably in his late fifties or early sixties, bearing down, speeding down the ramps and zipping around the corners, ahead of the car. 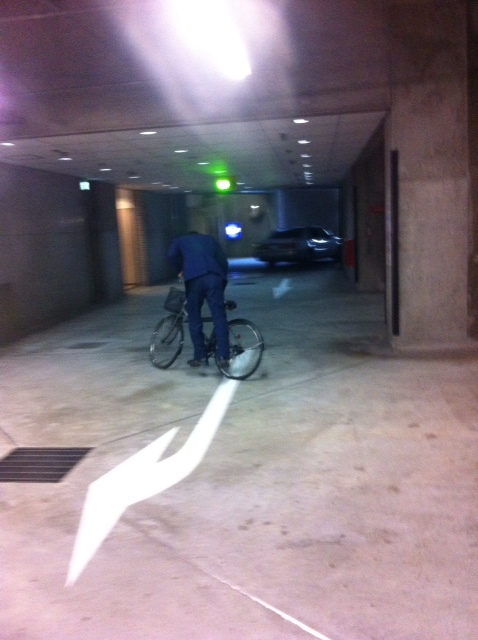 Parking-bike-man pointed out the spot, bowed deeply as the realtor started turning the car to fit into the space, and then in a flash, he was off again, back up the ramp to his station by the parking entrance. He was so zippy that the photos are terrible, but they’re the best I could do. 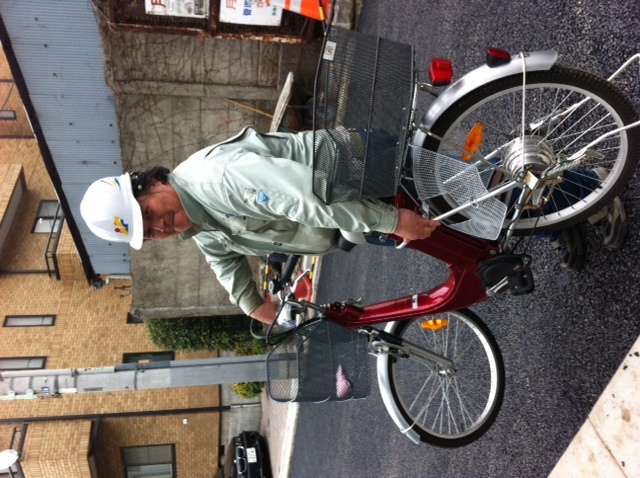 This is Japanese kindness and efficiency all rolled into one neat package – on wheels. Yesterday I had a flat tire on my bike so I brought it to the closest shop, pictured here. 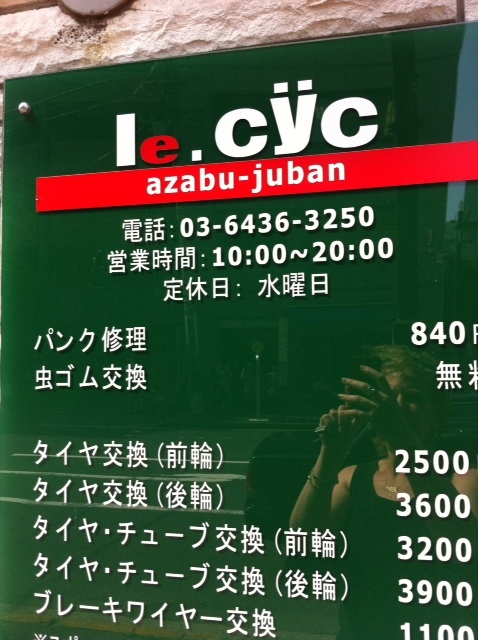 It is at the bottom of Sendai Zaka in the Azabu area of Tokyo. I wasn’t really upset about the tire since I had wanted someone to check out my noisy gears anyway. They told me they could fix the tire, but that that was all they could do since my bike was “illegal” in Japan. This was the third time I had been told that I had an illegal bike – the first two were by this and one other bike shop who would not help us put together the bike when it first arrived. I assumed the problem was the motor, but I was mistaken. 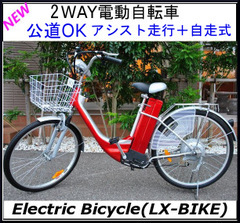 Please bear in mind as you continue reading, that I bought the bike here in Japan from one of Japan’s largest online retailers, a website called Rakuten. They are Amazon’s main competition in Japan and sell everything from books to clothes to jewelery to food to bikes – all at discount prices. 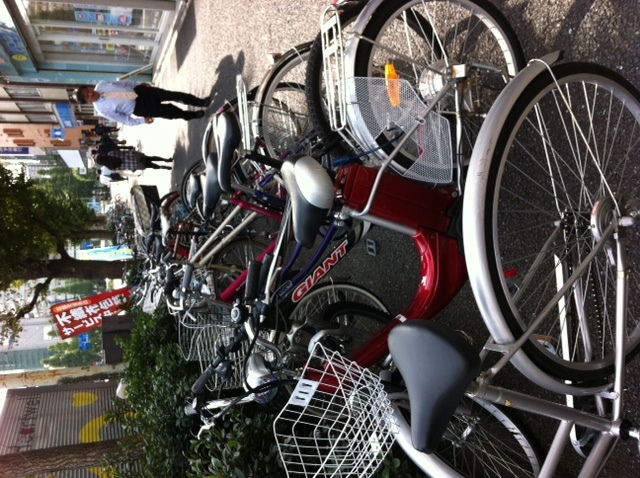 Bikes, similar to mine, with motors, were in the front of the Le Cyc store. “Those are bikes just like mine. Why aren’t those illegal?” I asked, trying to keep the “whine” out of my voice. It took me a moment to recover my senses. Under my breath I muttered something that I refuse to put into writing, and walked away from her. 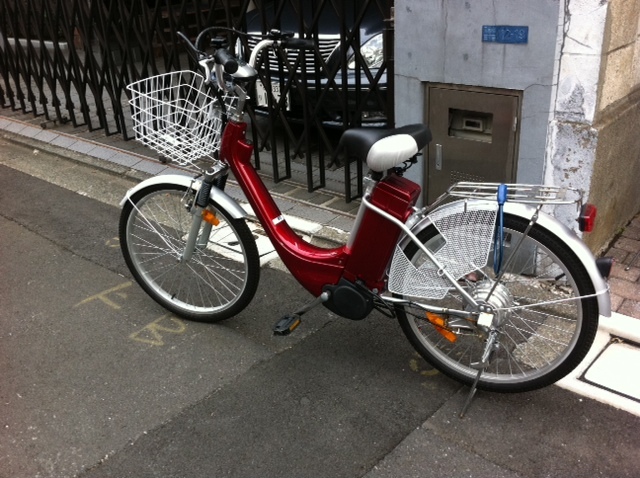 My bike cannot be repaired in Japan because it is a Chinese brand, yet I bought it from a Japanese company. I am so angry I am seeing white. Luckily my repair is very minor, and I think I can do it myself, but that doesn’t change the fact that I am going to have this problem for the rest of the bike’s life. Suggestions anyone? Ideas for what to do for maintenance on this bike? Ideas for how to remedy this terrible societal problem? I seem to be coming up with nothing. My road is under construction. 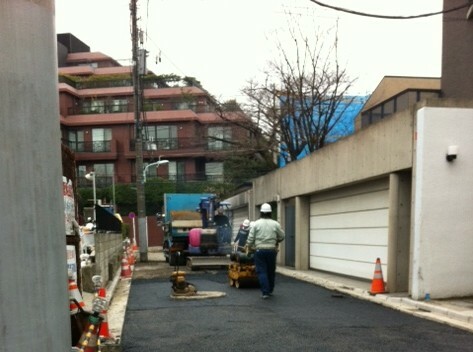 It seems that the water and gas pipes under the street are not as earthquake-safe as they could be, and needed to be replaced. The process has been painful and inconvenient, but I know it’s worth it to be safe. The other day the road was so torn up in front of my house that I couldn’t get in. Or, I could sort of get in, but there was no way my bike was making it – there was no solid road on which to ride; even I had to tiptoe through dirt. The lady who was “minding” the front of the road (i.e. standing by the do-not-enter sign and being extremely sure that no one really enters) shouted out for someone. The next thing I knew, a big, burly guy was lumbering toward us. Seriously, how many big, burly guys have you seen in Tokyo? They exist and they work construction, unsurprisingly. Without a second thought, he picked up my bike, ten-pound battery and all, and carried it down the street, depositing it neatly by my house. The whole time this was happening, the minder-lady apologized over and over again for the terrible inconvenience. Have I mentioned lately that the service in Japan is second to none? Yesterday I saw two Japanese people crash right into each other on a busy sidewalk in Meguro. They were walking towards each other and looking at their phones. I was following one of them on my bike and I could have predicted the disaster. Both of them were not walking in a straight line or paying attention to anything around them. Frankly, they are lucky that they bumped into each other and not a pole or something, which would have done some serious damage. Not to be mean or anything, but I was almost glad to see it happen. I had been going along thinking that the problem was me – people didn’t get out of the way for just me, or didn’t pay attention to me personally – either because I’m a woman or because I’m a foreigner. It turns out that I am completely wrong. Japanese are not considerate pedestrians with anyone. The amount of cell phone reading on the Tokyo streets has reached epic proportions. But there’s more to it than that. People read and walk – books, newspapers, magazines, you name it, they read and walk. Because of that, the pace is unpredictable, as is the path, so often people are all over the sidewalk. It is hard to walk or bike behind people who are reading. People also walk, or even bike, two or three abreast, both on the road and on the sidewalk so that no one can pass from the opposite direction, either by bike, on foot, or even in a car. I can’t tell you how many times I have approached groups who do not move and I have to step off the sidewalk to accommodate them. But all of a sudden, I realized that groups make other Japanese people do this, not just me Once in a group it seems that the group does not step into single file to accommodate traffic – foot or otherwise – approaching from the opposite direction. There are big signs, particularly in Meguro, about which side of the sidewalk is for bikes and which side is for pedestrians, but no one pays attention to the signs. I do my best to stay in the designated areas and to stay to the left, and I cycle – or walk – generally very slowly so as not to cause or be involved in an accident, but I sometimes feel like I’m the only one. Truly, I thought the problem was me, but it is not. The two Japanese people I witnessed in the minor accident yesterday were both fine. They were both knocked of balance for a moment, and out of their respective reveries, but were otherwise unharmed. They bowed to each other and went on their way – both of them back to their reading. I guess it’s just the Japanese way, something else at which to shake my head in this quirky country I call home. To be selfishly honest, though, I’m glad it’s not just me. Here’s a picture of me on my bike. And then here’s a photo of the bike itself. It’s big. It’s really heavy with that huge battery in the back, so it’s also a bit unwieldy. But it is really neat to be a cyclist in the city, I’ve found. I like finding my new routes to take with the bike and I feel like I garner respect when riding it. 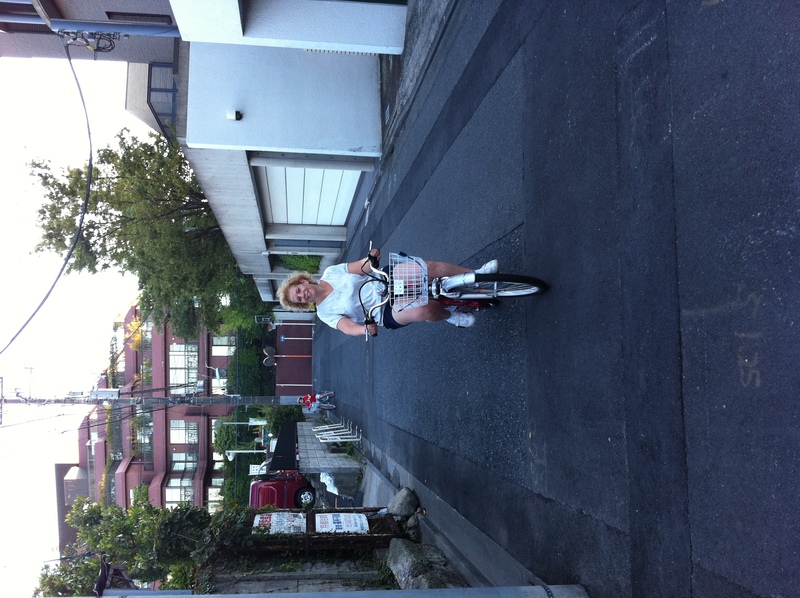 Just last week a group of American tourists in the city approached me when I was stopped at a traffic light in Hiroo. They had a map and were slightly lost; I helped them, and as they were saying goodbye, one guy said, “Hey, is that a battery at the back of your bike?” I laughed and nodded. They were so enthralled that they took a picture of it. These things are not common in the States – I knew that, but I guess I forgot. One thing I’m enjoying about the bike is figuring out how to navigate the maze of streets, pedestrians, cars and cyclists that populate the city. However, figuring things out and the actual “doing” are quite different. I know I need to keep to the left on the street, but when I wobble a bit, keeping to the left and not rolling off the sidewalk are quite different things. The pedestrians in Tokyo are just terrible. They’re slow, and they weave on the street. Their path is impossible to predict, so several times I’ve thought someone would move right and at the last second he swerved left and I had to quickly correct my course. Also, they are completely oblivious. They don’t look around them or listen. Sometimes they’re just staring into space and not paying attention to anything so they walk out right in front of my bike. I’ve already had to stop short more than once to avoid a pedestrian. Even when they’re walking toward me, they’ll stare at me for long moments and sometimes they force me to stop because they’re walking five abreast taking up the sidewalk. Where do they think I’m going to go? It’s maddening. I have to admit that I have a funny habit when cycling – I talk to myself. Out loud. The running commentary goes something like, “Okay, made that turn. I wonder if that schoolgirl is going to move for me. Do you think she can see me? She’s only staring directly at me walking in the middle of the sidewalk. Aack, old lady in front of me – I have to avoid her. Wait, is she moving left or right? Maybe I should ride on the road. Oh man, is that a taxi coming up behind me…” And so it goes on. It’s a weird, little habit and I sort of bank on the fact that the Japanese don’t understand my English. It sort of helps me understand and correct and keep on the route. Today I took my second spill off the bike. I know I’m still a terrible cyclist, and that’s after about three weeks of practice/improvement. Both of my falls took place in the same spot – in front of Nishimachi, Sydney’s school. There’s just a lot of pedestrians and cars right there and it makes me nervous. I have to learn to just stop riding, or even to walk the bike when I’m nervous, because when I’m nervous, I wobble more. In this case – and in the case of last week’s fall – I was trying to get onto the sidewalk and the curb is too high. If I was going fast, it wouldn’t have been a problem, but I was going very slowly and instead of rolling over the curb and onto the sidewalk, I hit it and fell over. Again, I was going about 5 feet per hour, so it was a slow-speed crash, but I have a lovely lace of cuts and bruises down my right leg. My right palm isn’t too pretty either. It’s about the same as the cuts last week, though. At least I’m not getting worse. Most importantly I got back on the bike right afterward both times. I’m never going to improve if I don’t keep riding every day. So I’m a little bit cut and bruised tonight, but I’ll take a bath and it will be all right in the morning, I’m sure. I am trying very hard not to be discouraged. Like many other things in life, becoming a cyclist takes time and practice. At least for me, it doesn’t come naturally. But hopefully, with practice, things will improve. I’ll keep you posted. The scene in Taipei, with more sooters than bikes, but you get the picture. 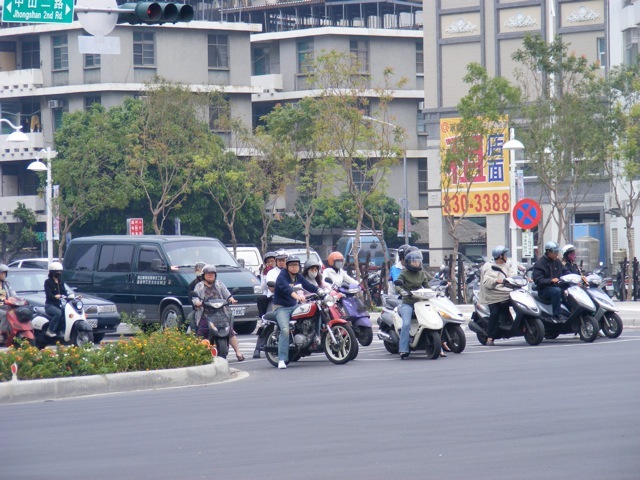 One of my favorite pictures from our trip to Taiwan a few years ago was taken on the street while we waited for the light to change so we could cross. The cars stopped, as expected, in a neat row as the light turned red, but then the bicycles and motorbikes kept coming toward the front of the cars. Soon the intersection teemed with them, all jostling for position to be the first out of the gate when the light turned green. There were regular human-powered bicycles with one rider, there were scooters with any number of riders depending on who needed to sit or who could stand on the muffler in the back, and then there were the full-on motorcycles, which generally had no more than two passengers. There were even apparent mothers, toting one child in a seat on the front of the bike and another one the back of the bike, while carrying a basket full of groceries in front of the front child. Of course, her purse is slung across her shoulders. Well into the twenty-first century, Asia is still a two-wheeled continent in many areas. I’m stereotyping a bit, of course, but even in modern Tokyo, it’s very common to see multiple riders on bikes and the streets and sidewalks congested with them. The ever-popular scooter is a common commuting method in a country where the infrastructure is built for public transport, and not for the complex and large system of roads that we expect in the United States. do with me? Well, it seems that my new job is located in an area that is a little bit awkward for commuting. It’s only one train-stop away, but it will take me 5 minutes to walk to my train station, five or eight minutes on the train, and then ten or twelve minutes to walk up a hill to the school where I will teach. If I walk, it takes thirty minutes. I think it’s time for me to buy a bicycle. I have never been particularly good at biking; I have terrible balance, but I can do it. 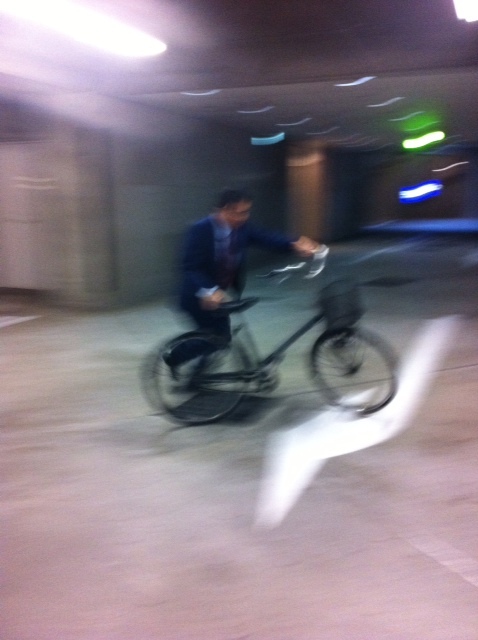 The weather in Tokyo is pretty good for bikes, too. It doesn’t rain too often and the extreme cold is rare and short-lived. The worst part of biking would be the heat, and I won’t be biking in the summer because I’m a teacher and won’t be in school. The next thing to tackle however is the big hill to school, not to mention the big hill atop which my house sits. Tokyo is NOT flat. And so I believe I’m about to buy a power-assist bike to help with said hills. If I do it, the whole commute should take me under fifteen minutes. In my time-crunched world of home, children, teaching and writing, I think the time-savings will be well worth it. I think it’s time for me to get closer to the Asians. Time to buy a bike. Stay tuned to see what transpires.